In 2002 Wittenborg University partnered with BTC, an international consultancy specialised in corporate training programmes (part of Birdsalls Limited). The business school started developing its international English taught business programmes, gaining state accreditation for its International Business Administration programmes from the world-wide recognised Netherlands and Flemish Accreditation Organisation (NVAO) in 2006. Since 2006, Wittenborg has emerged as an English speaking international University of Applied Sciences focussed on management and business administration, and entrepreneurship within an international context. It currently numbers around 400 students and staff from more than 60 different countries. From 2008, Wittenborg University was managed through the Wittenborg University Executive Trust by the Netherlands based partners of Birdsalls Limited, and its Board Members are Maggie Feng (CEO) and Peter Birdsall (Chair of the Executive). The organisation has its roots in Switzerland, United Kingdom and China and is based in Apeldoorn (the Netherlands). In 2012, Wittenborg University was validated by the University of Brighton (UK) for its Master (MSc) programmes in International Event Management and International Tourism Management, with International Hospitality Management in 2013. 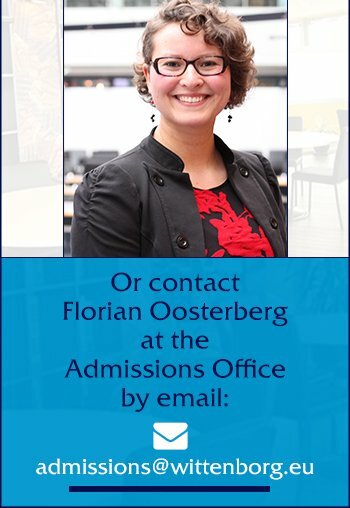 In 2012, Wittenborg's 8 Bachelor pathways in International Business Administration (IBA), were again positively accredited by the NVAO, valid until October 2018. In 2012, the IBA (Bachelor of International Business Administration) and its 8 pathways were successfully given unconditional accreditation for 5 years by the German Foundation for International Business Administration Accrediation (FIBAA). In 2013, the EBA, a Bachelor of Entrepreneurial Business Administration was accredited by FIBBA. This programme, and the IBA in Entrepreneurship & SME Management, will move to the new Wittenborg University Amsterdam Campus from September 2013. In 2014, Wittenborg University gained FIBAA Accreditationfor its Master of Business Administration programmes, in three specialisations, General Management, Entrepreneurship & Innovation and Hospitality Management. In 2015, Wittenborg University announced its expansion to the north side of the railway station at the Spoorstraat 23 where it will establish its Postgraduate and Research Centre campus. In 2015, Wittenborg announced that it was opening a Bachelor programme of Business Administration in Entrepreneurship at a prime location in the centre of Amsterdam.